It’s been a while since my first mini review’s series post went up, so I thought it was about time I followed it up. 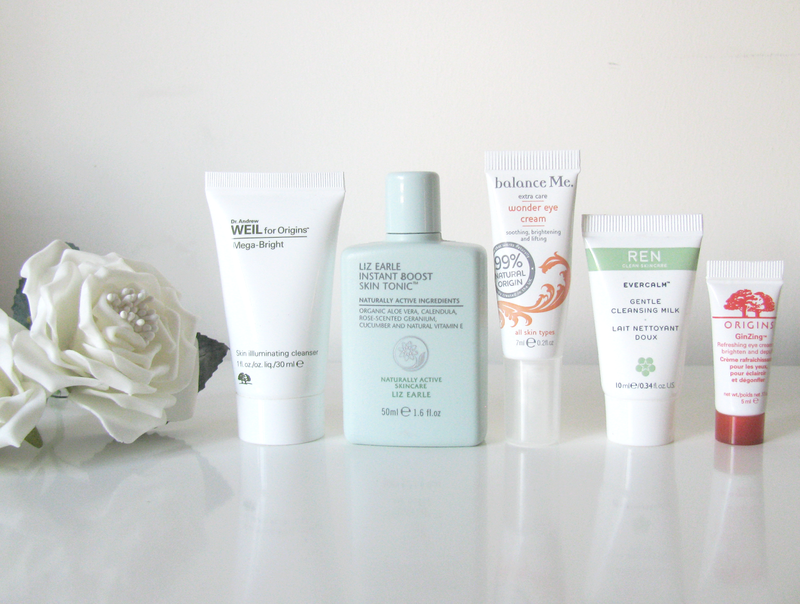 I noticed I had a lot of skincare sample products in my ‘to review’ pile and having used all of them for some time now I thought why not throw them all together. Origins Dr.Weil Mega Bright Skin Illuminating Cleanser – I received this as a freebie when I purchased the GinZing Moisturiser and I was eager to give this a whirl. Described as a refreshing foam cleanser with Dr. Weil’s natural Mega Bright skin illuminating, light infusing complex that purifies the skin and melts dulling. As I would describe my skin as quite dull, I thought this might be a pretty decent product. Following instructions, I used this for a good two weeks as my cleanser and it’s safe to say this particular cleanser wasn’t for me. I just found it left my skin feeling very tight and ultra shiny, almost as if the cleanser left a sheen to my skin which got oiler throughout the day to the point where it literally melted my make-up away. It worked really well to remove makeup and it did a really good job to remove any dirt from my skin, but I guess this one just wasn’t for me. Liz Earle Instant Boost Skin Tonic – This product is another that I received as a freebie when I purchased something from Liz Earle quite a while back and having not tried many Liz Earle products, I was excited to see what this would do for my skin. Described as a heavenly floral scented toner that refreshes the skin after using the Cleanse & Polish. I’ve used this product on and off for a long while now and it’s a product that I neither love or hate. It works well to tone and refresh the skin but I have noticed that when my skin a little dry it does irritate it, so I have to be careful with this one but it is a lovely toner. Balance Me Wonder Eye Cream – I got this as a freebie in a magazine quite a while back and i’d never really used an eye cream before as I never thought I needed one but this one has somewhat converted me. Jam packed with lots of natural ingredients including cucumber, skin brightening lemon and witch hazel this product is designed to hydrate and brighten the eye area. I’ve been using this on and off, when I feel the need mainly in the morning to help wake up my skin and reduce the puffiness of my tired eyes. I really like this product and you literally need the smallest amount, so this sample is lasting me really well! Ren Evercalm Gentle Cleasning Milk – This I got as a magazine freebie along with a few other Ren products a few months back and i’d been wanting to try some Ren products for a while so again I was pretty excited. Described as a gentle cleansing milk for sensitive and delicate skin, to cleanse and sooth. Leaving the skin feeling calm, purified and soothed whilst also removing dirt and makeup. As I mentioned in my previous post, my skin has been pretty irritated recently and this I found helped so well to calm and sooth my dry skin without irritating even more. For the first Ren product i’ve ever sampled i’m pretty impressed and I can’t wait to try more. Origins GinZing Eye Cream – This is another freebie I got when I purchased the GinZing Moisturiser and one i’d wanted to try for a while. Similarly to the moisturiser, this is designed to wake up the eye area by brightening, depuffing and reducing the appearance of dark circles. Similarly to the Balance Me Eye Cream, i’ve been applying this one in the mornings to help wake up my eye area and reduce the puffy look I have when I first wake up. It works really well for me and just like the moisturiser I love this, so much so I will probably purchased the full size when I use this up.